There are a few conclusions I've reached after dealing with religion and believers for some years now. One of them is that no one can get through to a believer whose mind is made up and doesn't give a damn about evidence. This is not a judgment call, nor something I wish believers to feel guilty about. It's merely a remark about my observations. It is not condemnation but a bewilderment in trying to understand how this condition persists. (And I'm not alone on this. Numerous social/psychological studies are still in progress trying to understand this state of mind.) I feel sadness observing the fear, however small, in the demeanor of the believer whenever beliefs are brought up. I've concluded that for those who have made up their minds, their minds are closed. To that extent, such a one is, according to one writer, “incapable of learning.” This is sad, and self-defeating, all the more so if it is a habit firmly reinforced. Another conclusion has to do with being an atheist living among those who are believers. I'm not so sure anymore that it's a good idea to come out as an atheist. For one thing, most people, not just believers, don't know what the term means. For another, many believers slam their mind's door when they meet an atheist trying to make a point. I've been accused of trying to “convert others to atheism,” as if it were a religion. This despite the fact that atheism is not a moral stance, that I'm talking about morality alone. The fact is that religions are the ones supporting missionaries trying to make converts to their chosen sects, as if each one of them is the one true one. Though I am perceived as a threat as an individual, in actuality the threat comes from asking the avoided questions any precocious five year old child would bring up at the spur of the moment. These child-like questions and comments really throw believers, and it isn't because they're radical, but the ones many of us seriously and doggedly pursued, and they refuse to. Their minds are already made up. I keep encountering believers like the creationist who debated Richard Dawkins. He kept telling her to go to the Natural History museum nearby to see the evidence for evolution herself, and she kept refusing. Believers like her don't really want to be bothered with the facts, and that's a fact. So I'm thinking that rather than be seen as a threat and shut out, I ought to consider something else. It's the questions themselves, which have to do with morality and rational thinking that they don't want to be bothered with. It isn't so much that atheists and agnostics are asking them, but that they are the queries of other human beings. This is important. These are human questions, not aimed for the most part as anti-religion ones. It is the anti-human, anti-morality, and anti-reason in faiths which we as human beings are challenging and have every right, even obligation, to challenge. And as such, religious sensitivities be damned. Much is poisoned and destroyed whenever fantasy becomes policy. This brings me to another observation. Whenever and wherever faith overrides facts as policy, we all suffer. Religious persecutions, wars, and usurping of civilizations often have the same cause. Religions, like all other ideologies such as Nazism and Communism, are all about gaining absolute power, and such power controls “the truth.” While in the pursuit of such power, the ends justify the means. And if the ends justify even genocide, they are accepted by good people as a necessity for the greater or greatest good. (While the believers would deny this extreme as immoral, their belief in “sacred” scriptures demands such an extreme.) Whenever the power becomes absolute, whether in a nation or a church, what it declares as truth or falsehood must be believed, and punished if it is challenged. Personally, as a citizen who served in the military to support freedom of conscience and speech, I feel compelled to challenging attempts to suppress either of them through the use of religious righteousness. Religions, like all other ideologies such as Nazism and Communism, are all about gaining absolute power, and such power controls “the truth.” So, rather than identify myself as an atheist, I've decided to shift the emphasis to humanist. 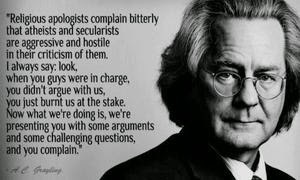 Atheist is not a moral position, but humanist is, as in “There's no 'God,’ so we have to look after one another.” Humanism is positive and looks upon ignorance about morality as evil. I regard ignorance as the greatest impediment to goodness and human progress, and recognize that the world is filled with ignorance. And too much of human ignorance is due to the deliberate and preconditioned habit of religious indoctrination, which requires deprogramming to get people aligned with reality. As social philosopher Eric Hoffer observed, it is astounding how much unbelief is necessary to make belief possible. I want to be that precocious child who asks questions about beliefs and unbeliefs. They are very human concerns. I'm just a human being concerned about the impact of irrational beliefs and the ignorance of reality, the resulting fears, paranoia, and confusions they produce. I speak as a human being to other human beings, rejecting all doctrines that divide us. I encourage believers and non-believers alike to pay attention to the fact that the scripture writers really, really, hated humans, as shown by their constant, unending, negativity toward us. I'm an enemy of the doctrine that unless a person believes certain things, that person doesn't have real value. My speaking out has and will produce backlashes of course, but I'm hoping that eventually at least one believer will have that “aha!” moment, when all the facts the person ignored or rejected come together as understanding. There is nothing quite as exhilarating as one free person's freeing another from dogma. After all, we do have the right to be free. And, we have a right to advocate for that right.